An interesting post about antique rifles over at mctuggle.com – it seems it wasn’t only sword-smiths that put effort into intricately adorning and crafting their weapons of choice. If medieval fantasy lovingly describes the inscriptions and ornamentation on blade hilts, I can imagine more contemporary fantasy describing the intricate woodwork and metalwork on some of these. Weapons hold a special place in all cultures. The tradition of a special bond between the weapon and its owner is one we see often in history, folklore, and literature. Think of the samurai’s katana, Thor’s Mjölnir, Arthur’s Excalibur, Bilbo’s Sting, and Davy Crockett’s Ol’ Betsy. This morning, I attended a presentation at the Charlotte Museum of History on the Mecklenburg Longrifle, a fine and highly sought-after weapon produced here in the Charlotte, North Carolina, area in the 18th and early 19th centuries. Michael Briggs, the author of The Longrifle Makers of Guilford County and The Longrifle Makers of Forsyth County & Davidson County, displayed some breathtaking pieces from his personal collection, and generously identified and discussed longrifles that audience members brought in. 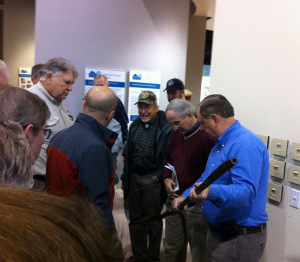 Author Michael Briggs examining a longrifle. ← What Did Tolkien Think of Fantasy Fiction?